This parking lot lease provides additional parking for the tenant's employees, and includes a tenant right to purchase the leased property pursuant to specified terms and conditions. In the event the tenant exercises the purchase option, one half of the rent previously paid is credited against the purchase price. 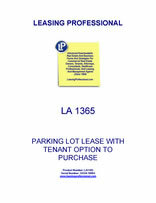 THIS PARKING LOT LEASE WITH OPTION TO PURCHASE (the "Agreement" or “Lease”) is entered into as of ___________, between COMMERCIAL PROPERTY LANDLORD, INC., a __________________ corporation (“Landlord”), and AGREEABLE TENANT, INC., a _________________ corporation (“Tenant”). particularly described as follows: ______________________ (the "Property"). B. Tenant provides and operates short-term parking facilities for its employees (the "Parking Facilities"). C. Tenant wishes to lease the Property, and Landlord wishes to let the Property, for the purpose of operating the Parking Facilities in accordance with the terms and conditions of this Agreement. 1. Term. The term of this Agreement will begin on ____________, (the "Commencement Date") and shall end on ___________, (the "Term"). 2. Rent. Tenant agrees to pay Landlord the amount of ______________ Dollars ($________) annually (the "Rent"). The Rent will be paid in equal quarterly installments of __________________Dollars ($_________). The first such payment shall be due and payable on ____________, and thereafter Rent shall be paid on the first day of each __________, __________, __________, and __________________ during the Term. If Tenant exercises its Option to Purchase (as defined below), fifty percent (50%) of all amounts paid under this Section 2 shall be applied towards the Purchase Price (as defined below) as a credit to Tenant. 3. Additional Rent. In the event Landlord does not remove the currently existing unfinished structure located on the Property, and fill in the existing excavation and basement for said structure on or before ____________, then the rent shall be ______________ Dollars ($___________) per month retroactive to the Commencement Date. 4. No Set Off. Tenant waives and disclaims any present or future right to withhold any rent payment or other payment due under this Agreement, or to set off in any action for rent, as a result of any obligation of Landlord, Tenant agrees that it will not claim or assert any right to so withhold or set off rent. 5. Interest/Service Charge. Tenant shall pay Landlord a service charge of Five Percent (5%) of the amount due for all quarterly rent payments not paid by the tenth (10th) day of the quarter for which they are payable. The service charge is imposed upon Tenant in an effort to reimburse Landlord for the inconvenience of handling, receiving and collecting delinquent payments. 6. Permitted Uses. The Property shall be used by Tenant only for purposes of operating a commercial parking lot, and for no other use or purpose without the Landlord's prior written consent, which shall be granted or withheld in Landlord's sole and subjective discretion. The Tenant shall comply with all laws, ordinances, codes and regulations regarding the Property and the permitted uses upon the Property. 7. Operating Expenses. Tenant agrees to pay all expenses associated with the holding and operating the Property and the Parking Facilities, including electric or gas utilities, accounting, trash and snow removal, general maintenance, insurance, attendant's salary, property taxes, special assessments, water and sewer assessments and other charges imposed by law or against the Property as part of Tenant's obligation hereunder. 8. Permits. Tenant will apply for, pay for and keep current all permits and licenses required for the lawful operation of the Parking Facilities. (b) Construction Standards. The construction of all improvement to the Property shall be done by Tenant in a workmanlike manner in accordance with industry standards using quality grade materials, and shall comply with all laws, Ordinances, Codes and Regulations governing the Property and the construction of the improvements. Tenant shall pay all contractors, materialmen and laborers for the improvements and shall not allow any mechanic's lien to arise which is not removed or bonded over within sixty (60) days of filing. All improvements to the Property shall remain upon the Property and shall become the Landlord's property upon the expiration or termination of this Lease, except for trade fixtures, including the Attendant Facility, which may be removed by Tenant provided Tenant is not in default of the Lease and provided any damage to the Property or the improvements are adequately repaired. (c) Mechanics' Liens. The parties agree that Landlord's Property interests shall under no circumstances be subject to a mechanic's lien upon the Property occurring as a result of Tenant's construction activities thereon unless bonded within sixty (60) days of filing. Tenant shall pay all contractors when due, following commercially reasonable practices for the distribution of the construction payments, including, without limitation, verification of completion of work, progress payments, use of lien waiver checks to its general contractor and subcontractors, and require the general contractor to use lien waiver checks for its payments to its subcontractors and materialmen. (d) Notice of Non-Liability. Landlord shall have the right to post upon the Property a notice that Landlord, as owner, is not responsible to contractors, materialmen, or laborers for any non-payment of materials or work performed upon the Property. Tenant shall cooperate with Landlord in posting the notice and keeping it posted in a conspicuous place upon the Property. 10. Insurance. Tenant shall procure and maintain throughout the Term an insurance policy, at its sole cost and expense, insuring Tenant against all claims, demands or actions arising out of or in connection with Tenant's use or occupancy of the Property or the condition of the Property (the "Policy"). The amount of insurance shall be a minimum amount of $3,000,000.00 and will be bound with an insurance carrier reasonably acceptable to the Landlord. Landlord shall be named as an additional insured and all Policies shall provide that the Landlord will receive notice of cancellation at least thirty (30) days prior to any cancellation and/or expiration of such Policies. Tenant shall provide proof of insurance on file with the Landlord at all times. If these provisions are not met, the Landlord shall be entitled, but shall not be required, to obtain such insurance at the cost of Tenant, which shall be paid by Tenant within ten (10) days after the Landlord gives Tenant notice. Any premium remaining unreimbursed to Landlord after said ten day period shall bear interest at eighteen percent (18%) per annum. Failure to maintain insurance shall be an Event of Default (as hereinafter defined). 11. Access. Landlord shall permit no less than two (2) full vehicular entrances into the Property pursuant to the Development Requirements. 12. Security Deposit. Tenant shall deposit with Landlord and shall maintain at all times the sum of ______________ Dollars, ($________), as security for the faithful performance by Tenant of every term and condition of this Lease. Tenant shall not be entitled to apply the security in payment of rent. If there should be a default by Tenant in respect to any term or condition of this Lease, Landlord may use all or any part of the security deposit to perform the same for the account of the Tenant, or for any damages or deficiency. Any interest accruing thereon shall be for the sole benefit of Landlord. If Tenant shall fully and faithfully comply with all of the provisions of this Lease, then the security deposit or any balance thereof remaining shall be repaid to Tenant within sixty (60) days from the termination of this Lease. In the event of any sale, transfer or assignment of Landlord's interest under this Lease, Landlord shall transfer the security to the vendee, transferee, or assignee, as the case may be, and Landlord thereupon shall be released from all liability for repayment of the security, and Tenant in each instance shall look solely to such vendee, transferee or assignee for repayment of the security deposit. 13. Tenant's Obligations. The Tenant, at its own expense, shall properly maintain and keep the Property and all improvements in good order, condition and repair. The Tenant in maintaining, repairing or improving the property shall not allow any mechanic's liens to arise which are not bonded over within sixty (60) days of filing. The Tenant shall not permit waste, damage, or injury to the Property or the improvements.